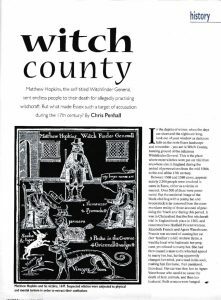 In the 16th and 17th centuries, Essex was ‘witch county’, a hotbed of ignorance, superstition and fear which Matthew Hopkins exploited in his self-styled role as Witchfinder General. Chris Penhall investigates. Hallowe’en, the Ancient Celtic New Year, when the dead walk the earth and magical rituals abound. And as darkness falls misty and cold on the eerie Essex landscape – remember, you are in ‘Witch County’, hunting ground of the infamous Witchfinder General where more witches have been put to death than anywhere else in England. Chelmsford was the site of the first witchcraft trail in England in1565. It involved Elizabeth Francis and Agnes Waterhouse, of Hatfield Peverel. Francis was accused of causing her cat (her “familiar” – an evil spirit in the form of a small animal sent by the witch to carry out malevolent acts) to kill Andrew Byles, a wealthy local who had made her pregnant yet refused to marry her; she then married Christopher Francis, but apparently tiring of him commanded her familiar to lame her husband. Agnes Waterhouse was accused of using the same cat, which she acquired for the price of a cake, to cause the death of farm animals and then her husband. Both women were hanged. Witch fever spread and between 1560 and 1680 over 2,300 people were involved in cases of witchcraft in Essex, over 500 of whom were prosecuted. They came from all parts of the county, from Barking to Saffron Walden, from Burnham to Great Dunmow, and their alleged motives included: being denied a piece of pork; being cursed and maligned; having their cattle cursed; being refused the nursing of a child; and refused a promised payment. If all this seems ludicrous, picture the Essex of the time: a large county with few towns and many villages of 40 to 50 households where everybody knew everyone else. Doctors were scarce and expensive, so the populace relied on “cunning men” – healers, herbalists and purveyors of charms – and women who specialised in the sphere of childcare and childbirth. If something went wrong against this backdrop of ignorance and superstition, mistrust, claustrophobia and hysteria could easily take hold on an entire community. In St Osyth in 1570, 13 women from the village were tried for witchcraft. It began with a petty quarrel between Ursula Kemp and grace Thurlow, after which Kemp was blamed for causing Grace’s daughter to fall from her cot and to become ill, and for putting a spell on her mother which made her go lame. This was just the beginning; accusations and fear spread like wildfire with neighbour accusing neighbour, and mistrust and gossip fanning the flames. Six of the accused were eventually put to death. Enter Matthew Hopkins, self-styled ‘Witchfinder General’ who fostered this climate of fear amid the extreme Puritanism and chaos of the last days of the Civil War in the 1640’s very successfully. There was no official body to prevent him from whipping up local animosities – Assize Courts were suspended and replaced by makeshift courts. Anarchy was on his side. Until 1644 he had been a lawyer in Manningtree; his new career began when he claimed to have discovered a coven of witches holding meetings close to his house. He targeted a frail elderly woman, Elizabeth Clarke, and set about proving her guild by “watching” i.e. depriving her of sleep and employing other forms of psychological torture such as pricking (skin was pierced with a spike in search of the devil’s marks) – methods he continued to use during his 18 month reign of terror. A confession was eventually extracted from Clarke, who also implicated five other women. They were amongst the 19 found guilty at the largest witch trial in English history held in Chelmsford in July 1645. All were hanged. Spurred on by his success, Hopkins travelled the eastern counties, charging a fee for consultation, survey and for every witch tried and sentenced. He was not the only Witchfinder operating in England, but he put to death more people than the combined totals of all other witchfinders put together until he disappeared in 1647. Witchcraft fever eventually died down with more political stability. The final execution in England was in Exeter in 1684, although the last recorded Witch-hunt which ended in death was in Coggeshall in 1699. Widow Corman had been accused of witchcraft and one day an unruly mob took the law into their own hands and threw her in and out of a pond several times. She died of influenza shortly afterwards. So, if you should drive through any of the picturesque towns and villages which dot our county remember that once in these places, people were hanged for being different, ill-tempered or old.and know that the evil working in Essex during those times was not witchcraft, but ignorance and intolerance, and those who preyed on it.